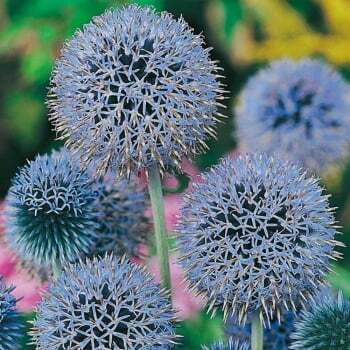 These Mr. Fothergill's echinops globe thistle seeds from Ruddick Garden Gifts have wonderful steel blue/purple mace like heads above deeply serrated grey green leaves. This is a great plant for the back of a border and makes a good dried flower. This hardy perennial will grow to 48" in height and is loved by butterflies and bees. Average of 50 seeds per pack.